Porting is one thing. But I've been messing around making custom levels, and I think I've gotten the hang of it. And due to the fact that there are no sprites for BluePrint or R-2, that means I get to be creative with them. As mentioned on Discord, for example, instead of R-2 being depicted as a garden of sorts, I view it as a ruined castle or fortress with rainbow water leaking through the seams and cracks. As for BluePrint, just imagine Sonic & Ashuro's tutorial level, but less likely to crash, and with some different art. Well. I'm tired to working Sonic 1 TMR. I will back to autumn. Download here! I know that it's almost pointless to make this kind of hacks at this time, when in fact there are already similar ones made a few years ago. But still, I made the attempt with the sole purpose of making a more polished and presentable variants, in addition to improving my knowledge and archiving everything necessary that isn't present in the community's guides. 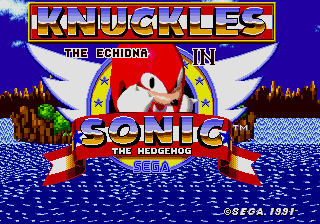 Both hacks aren't yet COMPLETELY done (mostly Knux's one), so I'll try to improve them later at some point. Oh, and special thanks to E-122-Psi for the special resources! Dj. Joker 27, Roxurface, Renegade and 9 others like this. Actually, I might like to see a remastered version of Tails and Knuckles in Sonic 1. There were some small oddities in Stealth's Knuckles version and drx/Puto's Tails version that I really didn't like that much (and didn't see in these versions), so I'm looking forward to see these completed. Ozaleto and MarkeyJester like this. I'm liking these romhacks, but I'm not fond of the A button's removed functionality. Sonic games from 1 to Mania focus on having 1 button for everything. I noticed that in Tails' game he uses the A button to cancel flight, but that could probably be remapped to down+button in midair. Are you sure? Sonic 4 uses the Y button to call Tails and the X button to perform the team attack and Sonic Mania uses Y for transform Sonic into Super. Actually, Sonic 4 uses the Y Button for Super Sonic and the X button for both flying (when pressed while in the air) and for the team attack (when pressed while on the ground). I thought I had to point that out. Yes, my bad. But since these games there were no more "1 button to everything" anyway. That's true but let's just forget Sonic 4 exists. I'm sure we all kind of want to anyway. It barely counts as part of the classics eitherway. Mania has a whole seperate button for super that's relatively out of the way for keyboards, and if I'm not wrong it was added later into development. (Think the switch version had the usual jump in midair, might be wrong though). It's like having a 6 button genesis controller with X Y Z not being used for anything but debug, except Z is the super button. If I recall, the super button was added via post launch patch; every version had the double-jump super until then. I believe the switch version was just updated a bit later than the others. HyaDoki and Renegade like this. If you'll feel like the bosses are too tough to you, you can use the "Quick Start" feature, which lets you respawn immediately upon death without reloading the level. Ultra DMA Queue - Flamewing. AsuharaMoon, Narcologer, Calvin and 4 others like this. Hello, everyone! It's been quite a long time since I've posted here. So, while I was browsing YouTube, I've found a lot of these videos where people try to beat "Game X" without doing "Action Y", so I was wondering... "Why not do it with Sonic too?" Since Sonic 1 is one of these platformers where you have to go to the right side of the level, I've been wondering if you could do so without actually pressing the LEFT button. And my question sadly got an answer as soon as I realized Marble Zone existed. Except there is a Wall Jump in Sonic 1. This is ReadySonic. A disassembly made by Mercury that is used to make Sonic 1 hacks with more ease. It includes a lot of bugfixes and cool features, such as... Guess what... The Wall Jump. I've tried beating ReadySonic without the left button, and I managed to progress past the first act of Marble Zone! But Act 2 was my new road block. So I thought: "Since ReadySonic is used to make hacks, I could hack the layout in a way that would let me beat the game without pressing the left button!" And that's how I've made every single level in Sonic 1 a straight line. After doing so, I've decided to make it so that you actually can't press the left button to move to the left, because there would be no point in doing what I did! And this is what the final result is like. Wonderful! Just with the press of a button, I managed to kill Sonic even before the Title Card got off screen! And now, after making some minor changes to the layout and the code, I've decided to release what came out of my hard* work. *Which was not really that much compared to all the hard work some hackers have to do to release actually good hacks. Those guys are the best. The main objective of this ROM hack is to beat all of the levels by taking advantage of the Spin Dash and ReadySonic's Wall Jump without actually pressing left. If you press left, you die, and have to restart from the last checkpoint you touched. Some changes have been made to some levels to make them actually beatable. Spoiler: A list of changes and hints to go through the levels and the bosses. GHZ3 - This level is perfectly beatable without actually changing anything. I've just removed the final checkpoint so that you can actually get some Rings before starting the boss. Not getting them will cause you to softlock. GHZB - Make sure to damage boost your way to the left platform so that you can hit Eggman. When you need to damage boost, always get hit by the left side of the Wrecking ball. If you go too much to the right, you lose. MZ2 - A spring was added in the block pushing section, so that you can face left and Spin Dash from the last of the three blocks to the next section of the level. I also added a block in a section early on in the level that is still possible to beat without said block, but requires extreme accuracy. MZB - It is recommended that you carry a shield and some Rings with you. Place yourself at the left side of the right platform and hit Eggman from there. There's no actual way to escape from Eggman's flames, so you'll need to damage boost at least 2 times to beat him. SYZ1 - ReadySonic fixed the shortcut that allowed you to skip the first moving blocks section and take the higher route, so don't waste time trying to get the Speed Shoes. Other than that, all routes are reachable, and the level is beatable without changes. SYZB - This boss should be easy enough. Just make sure not to go too much to the right, or you'll die. LZ1 - A spring was added so you could get through a section where you don't get enough speed to go on. LZ2 - A set of spikes was removed to allow progress. LZ3 - The button in the lower route has been moved so that it can actually pressed. The higher route is still unbeatable, but you can damage boost and backtrack. LZB - Really easy, just a few wall jumps will help you climb up the boss section. SLZB - Bring at least a ring with you. Place yourself at the right side of the middle See-Saw, but not too much at the right, otherwise you will get hit by Eggman's spikeball. As soon as Eggman is about to go to the left, take damage and let the spikeball bounce. This should be the optimal way to hit Eggman. Repeat this process 8 times and you'll defeat him. SBZ1 - A spring was added. You know those giant rectangular moving platforms? Do not take any route that contains them, as that means instant death. A checkpoint was removed to prevent a softlock. SBZ2 - Do not take the lower route at the beginning. The teleporter that awaits you will lead to a section where you'll be forced to die. The higher route now has a short climbing section that branches into two different pre-existing sections of the level. SBZ3 - A bunch of springs were added and a button was moved. FZ - This one is really going to test your skills. If you go past the 4th pillar, you're dead. If you are on the 4th pillar, as soon as you see it move upwards, you must hang on the red light that shoots energy spheres, and from there, do multiple wall jumps while you are between said light and the pillar. Once it goes down, you should be able to go to the left. While you're on the 4th pillar, just... hope the energy spheres aren't aimed at you in such a way they become unavoidable. You have 50 lives, good luck at getting through the game like this! Oh, and since some sections will require you to damage boost, there is now no ring requirement to enter the Special Stages. Just make sure you don't miss them. Oh, and you may not want to press left there either! Special thanks to Ceave Gaming and Razor and Zenon for inspiration. Download at the end of the thread. EDIT: Left enabled by accident the one minute time limit in Special Stages. Now fixed. Mr. Cat and maple_t like this. This is a mini hack that I've created called "Sonic 1 Green Screen"
Please do not give it a try. It's an absolute eye sore. 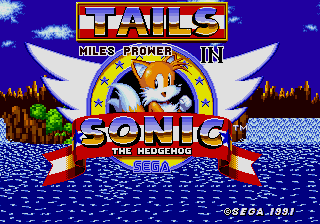 Along with that, palette hacks were phased out by maybe 2003 (give or take a year or 2, I'm not sure of the history of Sonic ROM hacking) And something else I noticed was that the title screen has REV 01 BGs, meaning that the ROM was directly edited instead of using a disassembly. (Because there's no way you'd have an understanding of how to use that guide) Leading me to believe you've used another outdated tactic: ESEII. This reminds me of the first thing I did when I started hacking: Virtual Sonic, which just removed all blue and green values (To simulate the Virtual Boy) and even I didn't have the balls to release it, I knew this was awful compared to the works of Flamewing or MarkeyJester. Yet I still made Sonic's Halloween Adventure. Just buckle down, learn M68K Assembly, grab a disassembly and learn a thing or 2 from guides. Key word: learn, don't just mindlessly paste the guides. Because I know you'll release it and say "Hurrr, look how much I worked on this!" with an icomplete spindash and broken collision. Then try something unique like changing how some variables change, it's not much but it still show you've done something on your own. The return of a dead project. Alex Kidd in Mario World is back and at Demo 2. I still have 10 levels to finish, but I get one done a day basically. Castles 2 and 4 are gonna be original when it comes to layouts and be more like traditional Alex Kidd castles. Still have a few bugs in this, and a few more enemies to change, but you get 7 full levels. maple_t and KCEXE like this. Here's a little Hivebrain 2005 branch I made. Basically just throws in a bunch of guides and engine optimizations. Looking at README.txt is important since it has all the credits for everything I used and mini tutorials on some of the tools inside it. Enjoy? Edit: New revision. Removes dumb secrets. Fixes some project files. Shades spindust. Removes blank tiles from Sonic's art. Changes header. Puts spindust mappings in a separate file. KCEXE, Bluestreak, AkumaYin and 1 other person like this. Totally unrelated to Sonic or Sega hacking, but I did some 3D Mario Kart Wii hacking earlier last year, with a port of all of the levels from Microsoft Hover! (1995) into the game as custom battle arenas, in a distribution called Hover Pack. It is both a My Stuff and an ISO patch mod, which includes new music, sound effects, modified powerups, new menu videos, and the custom battle arenas themselves. During development I also created Thwimp, an open-source Visual Basic MKWii utility which allows for the creation of new videos for Mario Kart Wii.